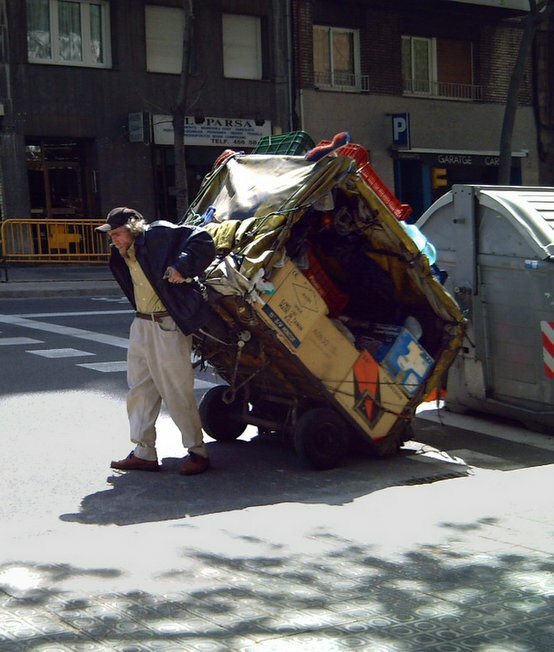 Many people in Barcelona make a living gathering cardboard, metal or plastic scrap from regular garbage or recycling containers. I was taking coffee when I saw this man passing by with an enormous cart, he was going very fast so I had to run two blocks after him to shoot. Sometimes it seems kind of cruel to photograph people in such situation, I just wish my image humbly contributes to cause a stir in the consciousness of our community. We can't see them here in my small city but in my hometown Manila there are many of them. I guess they flock to the big cities. Hope the world would be a better place to them, in the near future! I think we all wish the world could be a better place. My hearts goes out to him and all the other people in this awful predicament. thanks mark, I recommend people to check that post too. Nice shot. Here in Buenos Aires we see a lot of people doing the same, gathering things to make a living. Sad to see them so often in the streets, and so young!!! Thanks Kris and Karine for your opinion. same here in HK, Carlos, and usually they are senior citizens. A couple of times I thought about taking the photos but didn't. And about the last line of your caption: yes it does!